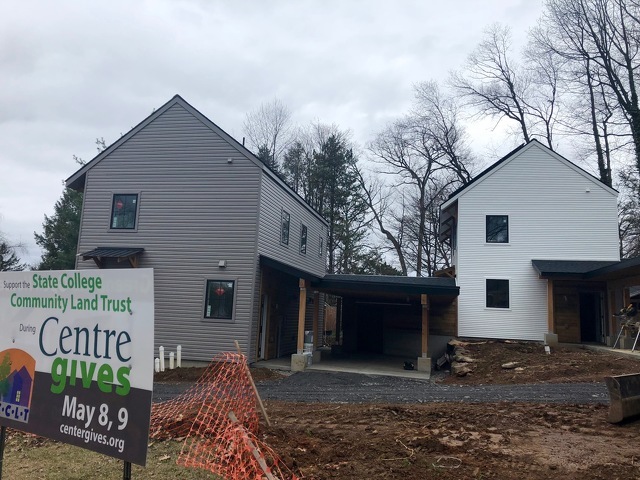 Construction of two new, energy-efficient homes for middle-income individuals and families in State College is nearing completion. 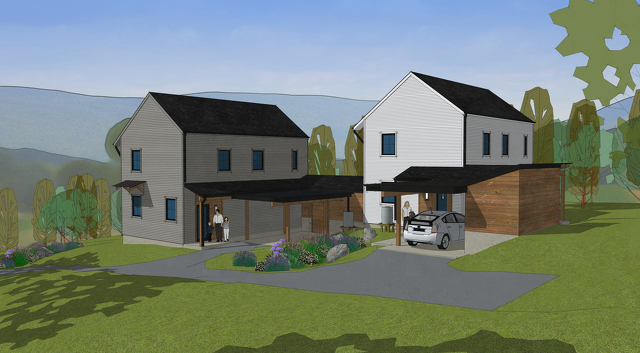 State College Community Land Trust's GreenBuild project broke ground last summer at 1394 and 1396 University Drive and construction began in the fall. The duplex comprised of two, 1,400-square foot homes will be finished in May with a certificate of occupancy expected for June. Constructed for energy-efficiency and equipped with advanced energy efficiency technologies, the three-bedroom houses are listed at $187,500 each. The project marks SCCLT's first new construction, but as with rehabilitated homes, buyers are required to meet income guidelines. Executive Director Colleen Ritter said earlier this month that sale on one is pending and some applicants are working their way through the qualifying process. Anyone interested in the homes should contact SCCLT soon. With monthly energy costs projected to be no more than $15, the GreenBuild homes will benefit not only the homeowners, but also are expected to serve as a model for builders, architects and other homeowners looking for ways to reduce energy costs. “The concept of moderately priced, energy-efficient homes has become a reality with GreenBuild," said Susan Venegoni, SCCLT board president. "The success of GreenBuild was possible due to the dedication of our partners and collaborators, and is a testament to the value of working together to address community needs." SCCLT approached Lisa Iulo, associate professor of architecture at Penn State, in 2014 about possible energy improvements to existing homes. Around the same time landowner Lassie MacDonald offered to sell the University Drive property to the land trust and the idea began to create something new collaboratively with the Penn State Hamer Center for Community Design and its Energy Efficient Housing Research Group. Iulo brought in Scott Wing, professor of architecture and associate dean with a background in design build, to work together with her and students. Over the next three years, about 40 students worked on the project eventually refining it into a realistic plan that was entered in a U.S. Department of Energy design competition. Throughout the process community members and housing advocates offered input and critiques. "This has been a project several years in the making starting with brainstorming with the Penn State faculty and students," Venegoni said. The community has been very responsive to our campaign to make this project a reality. Now, we’re excited to see the design become reality and ready for new homeowners who want to live in the Borough of State College." Wing explained last year that the energy-efficiency starts with the site itself, which is south-facing. The homes will be equipped with solar panels and high-efficiency appliances and lighting, have a low-water landscape and rain water catchment system and use sustainable building materials. Though it is a duplex, each side has a unique identity. The houses were designed with the idea that the future owners would likely be either young families or older people. SCCLT has had multiple partners help make GreenBuild a reality. State College Borough provided a grant to purchase the property from MacDonald. Centre County commissioners approved a grant to support the project. And individual donors have contributed. Last May, West Penn Power Sustainable Energy Fund, a nonprofit organization that invests in the deployment of sustainable energy technologies in the commonwealth, awarded a $100,000 grant and $350,000 construction loan which pushed the project over the top. In addition to Penn State groups, Envinity, Inc., Henry Architecture and Design and Weber Murphy Fox, Inc. have worked on the design and build. In the last 20 years, SCCLT has helped more than 60 individuals and families become homeowners in the borough. Applicants to buy houses through the land trust are provided education on budgeting and applying for mortgages and houses are only sold to applicants who meet federal income guidelines. The land is leased to the homeowner, reducing the ownership cost, and the house can in the future be sold to another qualifying buyer or back to SCCLT. 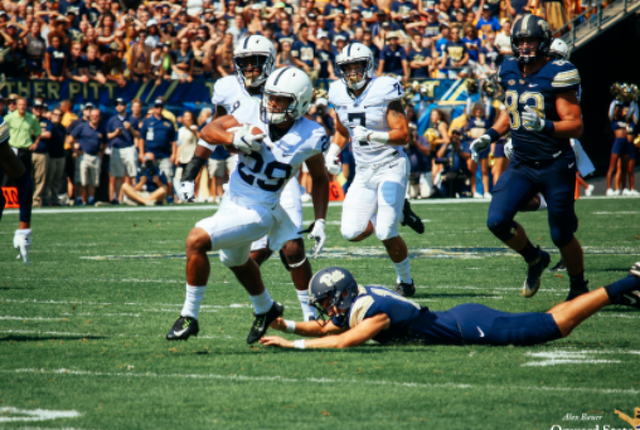 Penn State and Pitt will play the third game of a four-year series this season and the Panthers don't want to be done with their cross-state rival just yet. According to Jerry DiPaola, Pitt athletic director Heather Lyke is hopeful the rivalry will be renewed yet again.